Ever thought you could meet the real Santa Claus, ride a reindeer, stay in igloo or watch the sky go green every night? Lapland is an absolute dream destination and is so surreal and beautiful that it stays in your heart even after you are back to hustle bustle of the city. Kakslauttanen Arctic Resort is one of the best Igloo hotels in the world. Here you can actually spend a night in a glass igloo gazing at the starry sky and if you’re lucky you might spot the Aurora Borealis too. This place is every travellers dream and if you are travelling to Lapland you have to spend a night here. 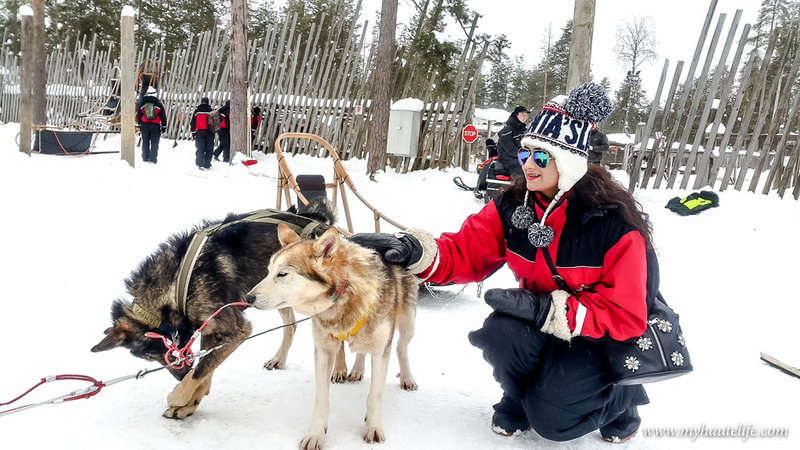 Husky safari: This ride is super exhilarating where you can actually ride a team six beautiful, tough and fast huskies that give you a tour of this snow-capped region. We explored the beauty and wilderness of the forest and then spent some time with the huskies. This was followed by a mini tour of the camp and the most delicious lingonberry tea in a cozy little hut. Visit to the arctic snow hotel: Ever seen a hotel made of ice? The Arctic Snow Hotel is rebuilt every single year and apart from having Ice Beds they also have restaurants, a bar and a chapel..
Reindeer Safari: Your visit to Lapland is incomplete without reindeer safari. A tour in the forest is what fairytales are all about. The enchanting views of this arctic paradise will remind you of every fairytale you’ve heard. Ride a snowmobile: What’s a holiday without some thrill? Brace yourselves for an action-packed ride deep into the dark and dense forest. It’s definitely the best way to explore the places around. Ice Fishing: Game for an adventure? Ice fishing might sound easy but it is actually so cold that you will give up on it in minutes. But it is definitely something to experience! Ever thought you could meet Santa in person? A trip to Santa’s Village is an absolute must when in Lapland. After meeting him you walk around the place, enjoy the sound of bells, icy landscapes, visit the post office, watch little reindeers hanging around and happy cheery people at the Santa Claus village..
It’s an experience of a lifetime when you watch the Lady Aurora paint the sky green. This is nature’s most magical display and can only be seen in certain parts of the world, Lapland being one of them. You can read the entire Northern Lights article here http://www.myhautelife.com/northern-lights/. To get a better idea about the place do click the link below..http://www.myhautelife.com/activities-in-lapland/. My Haute Life is a celebration of all things I love- Fashion, Lifestyle & Travel. The love for fashion & travel laid the genesis of my blog. Drawing inspiration from all parts of life and experimenting with my personal style, I want to recreate unique looks that are wearable and affordable. Also I’m so enamored with the idea of travelling to exotic locations. There’s something so enticing about exploring unique places and beautiful towns that people have only dreamt of. From living in an Igloo in Finland and spotting the Aurora Borealis in the North Pole to skydiving in New Zealand and chilling in BoraBora, I’ve done it all. For me the best stories are found in between the pages of the passport.